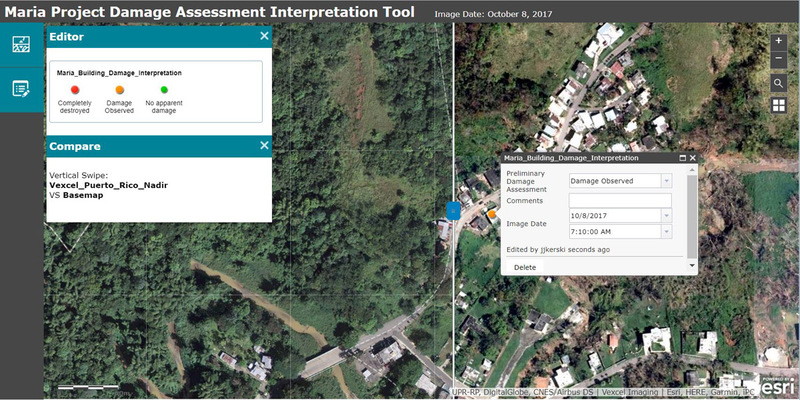 Redlands, California—Esri, the world leader in spatial analytics, today announced it is providing its ArcGIS platform, along with high-resolution imagery from the Vexcel Imaging, Inc., to students so they can use it to identify and assess buildings in Puerto Rico that were damaged by Hurricane Maria. Obtaining high-quality, accurate imagery is a crucial step in understanding the severity of damage since ground-level access is often difficult or impossible in affected areas. Esri created a powerful web application that lets students easily compare pre- and post-hurricane imagery as well as utilize tools to flag buildings. The imagery was captured right after the hurricane, which makes it easy to identify damage. This mapping tool allows the extent of damage to be assessed so students can assist in surveying and learn about disaster relief efforts. "The Hurricane Maria Mapping Project was an excellent opportunity for students to contribute to a citizen science project that has real-world impacts and incredible importance to the people of Puerto Rico," said Dr. Jim Makinster, Hobart and William Smith Colleges. "I appreciated the way in which the mapping tool enabled them to both see the ways in which the hurricane impacted the homes and lives of people while, at the same time, learning how this tool and data can be used to inform local and territorial governments, emergency management teams, relief organizations, and other efforts." Students who took part in the effort included those from K–12 and up to university level. Data was contributed by K–12 students from Environmental and Spatial Technology (EAST) initiative-supported schools in Arkansas, the University of Central Florida, Hobart and William Smith Colleges, the University of Texas at El Paso, and the University of Central Arkansas. "Hurricanes are always devastating to communities, and Esri is committed to applying our technology toward helping rebuild in the wake of a disaster like Hurricane Maria," said Jack Dangermond, Esri founder and president. "Part of this effort is not only to ensure that the people of Puerto Rico have the best possible location intelligence about where damage occurred but also to educate the next generation of geographic scientists who can lend their talents to the field of disaster relief." The next step of this project will be to use the contributed data from students and statistically analyze it to refine the results. After some additional reviews by experts, Esri will make this layer of information publicly available so organizations can use it to help with continuing recovery efforts in Puerto Rico. To learn more about how Esri uses The Science of Where to assist communities before, during, and after a disaster, visit go.esri.com/disaster_pr.